161 and 163 Wood Street house the Harward Center and the Multi-faith Chaplain. The Harward Center works to engage students with the Lewiston-Auburn community through offering a multitude of civic engagement opportunities. 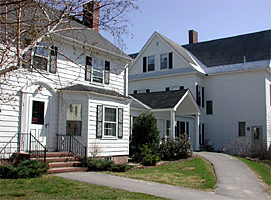 The Multi-faith Chaplain is a community that creatively serves the religious, spiritual, searching, and seeking community at Bates College.